After Whiskers . . . The moustache? From memory, it's also secured with a handful of self tapping screws along its bottom/inner edge. The final dress-up are the moustache whiskers. Those are short chrome extensions that go on the ends of the moustache. To secure those is tricky. The whiskers are secured with clips that are supposed to get screwed to the front panel. Fitting them as the factory intended is a pain. Instead, I modified the clips by soldering a nut to them, marked and drilled through-holes in the front panel and secured the clips by inserting machine screws from the back (inside of the front panel). 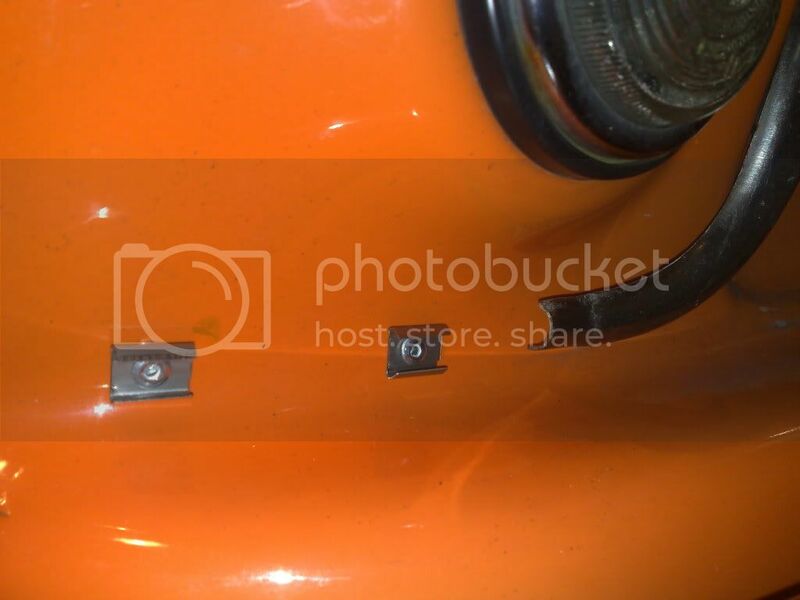 This allows the clips to stay with the whisker (not on the car) when removed, and it makes it much easier to install the whiskers without damaging the paint. Angie bought me an "EZE-TOW" Hydraulic “Disc” Brake Car Tow Dolly -The only car tow dolly in the world with fully vented double vane “disc” brakes - for my BIRTHDAY!! This Spring I took Paddy up to Vintage Sports Car for a head gasket replacement and tune-up. Vintage Sports Car Inc. is a division of Historic Race Car, LLC in Woodstock, IL. In talking with the shop owner, Yves Boode, I was advised to address the higher than normal oil pressure. Yves said that running oil pressure at a level higher than necessary only resulted in wasted horsepower as the pump was working harder than it needed to. This post is to record some of my online research into what exactly the Oil Pressure Relief Valve does in a Series-A engine and some basic thoughts on how to correct low and high oil pressure. The following comments are from Mini owners and online resource materials. I've tried to link and give credit to each of the comments and graphics. Condition - The condition of the oil pump and crankshaft bearings. What Effect Does the Oil Relief Valve Have On Oil Pressure? The oil pressure increases with RPM, a faster turning pump squeezing oil through the same size gaps. A relief valve bleeds off the excess oil when it gets to a certain pressure, which reduces the back pressure on the pump saving power. An adjustable valve lets you fine tune the relief pressure so you can set it as low as practical to save the most power. Where IS the Oil Relief Value on a Classic Mini? The oil pressure relief valve is located under the hexagonal domed nut on the front face of the cylinder block, directly above the starter motor . If the valve plunger is not seating correctly, or the spring is weak, this will prevent the correct oil pressure (60 psi/4.2 kg/cm2) being maintained in the engine lubrication system. To examine the valve, unscrew the domes nut with its folded copper washer and withdraw the coil spring and valve plunger. Check the length of the spring. This should be 2.86 in (72.64 mm). Inspect the face of the valve plunger for pitting, and that the valve is seating correctly. Renew the valve if necessary. If the valve is only lightly pitted, it can be lapped in on its seating using metal polish. A wooden dowel of appropriate diameter pushed into the open end of the plunger can be used to rotate it while lapping it in. Clean all traces of polish from the valve and seating when this operation is completed. Refit the components of the valve assembly in the reverse order of removing. How Does the Oil Relief Valve Work? Here's a quick and very rough paint sketch to show you what's going on with the Pressure Relief Valve system. The red passages are all unfiltered oil, the diagonal passage at the top leads to the port where oil leaves the block to enter the tube and travels to the filter head. The green circle is a cross section of the main oil gallery and contains filtered oil. The insert (shown in black) allows the gallery to cross the PRV tapping without the two parts of the oil system mixing, which it needs to do because the feed from the gallery to the rear main and cam bearings is on the outside of the PRV port. The ball or thimble then rests against the seat inside the insert, until pressure pushes it open against the spring and allows oil to flow back down to the sump. Part 2 of this DIY series will address my specific issue of oil pressure that is TOO HIGH when motoring along at 3000 RPM. With the help of Yves Boode, Vintage Sports Car, in Woodstock, IL, I've got a step-by-step process to check the pressure relief value components that may be causing the pressure to remain too high. The recommended fluid for use in your Mini's brake and clutch system is DOT4 brake fluid, which is readily available from most auto parts stores. Please do not use DOT3 fluid; we've heard from too many customers who've had brake and clutch failures who have also been using DOT3. This does not necessarily mean that the DOT3 caused it, but it's certainly a frequent coincidence. The manual also recommends that brake fluid be flushed every 24 months. Reason? As time passes, moisture gets absorbed by the brake fluid, which then loses its effectiveness. 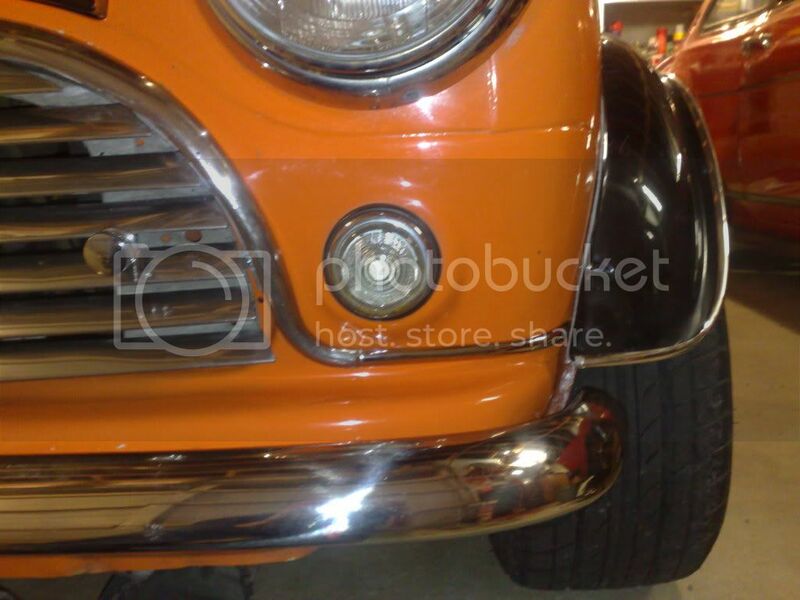 Some folks are using DOT5 silicone fluid for their classic Minis, because it does not absorb moisture or damage paint. The problem? It's not recommended for the British hydraulics, and the manufacturers of brake master cylinders will not warranty their product if silicone fluid is used. If you use silicone fluid you do so at your own risk!